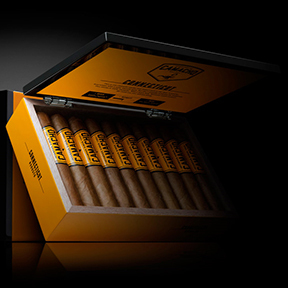 Unlike many of the cigars in Camacho's stable, the Camacho Connecticut is on the milder side, offering a smooth smoke with an intense creaminess that rounds out the spicy kick of the Corojo binder. Aleman Ligero from the Dominican Republic and proprietary Honduran Generoso tobaccos add to the flavor profile, and the blend is pulled together with the Ecuadorian Connecticut wrapper, which deepens the flavor even more. The medium-bodied Camacho Connecticut is a great cigar to smoke any time of the day or night.